I wanted to share a card I made for Etsy. This was a first, and I absolutely love the "boss lady" energy this card gives out! I went with the heels for this one and will have to try a handbag next time. I gave the heels the Louboutin look with the red bottoms. I stamped the heels stamps from Sweet Stamp Shop's "Stay Classy" set, and colored it with copic markers. I used a Lawn Fawn "Stitched Hillside Border" die for the curved edge on the gold and layered a black card stock on top of it. 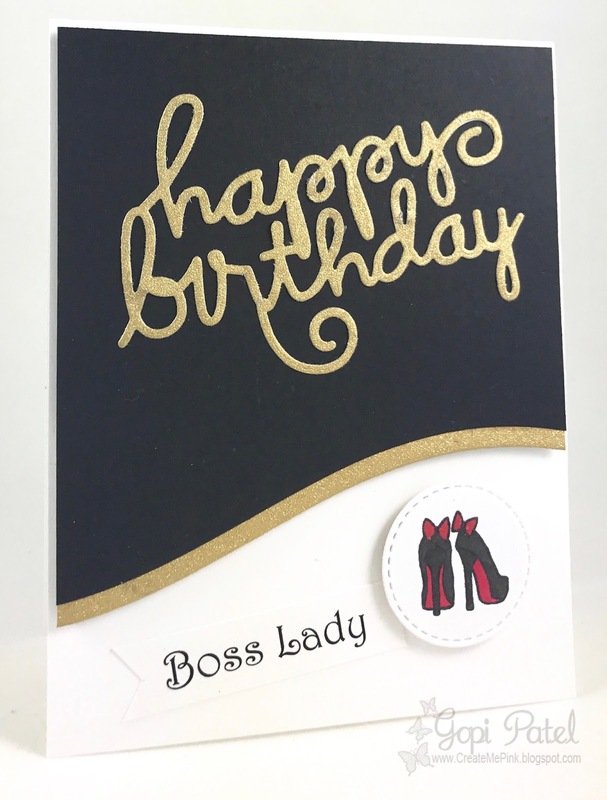 I die cut the the Paper Smooches "happy birthday" die in gold. The sentiment was printed out and I placed everything onto a white base. I wanted to share a card I made using the Large Peony Stamp from The Ton Stamps. The Ton has gorgeous floral sets! I stamped the Large Peony stamp and leaves onto vellum using versamark and then heat embossed it using rose gold embossing powder from The Ton. I colored the flower using copic markers and then cut the peony and leaves out. I adhered them to a piece of shimmer cardstock. This was then adhered to a black piece of cardstock which was embossed using a We R Memory Keepers embossing folder. The piece was then attached to a base card and topped off with a "happy" sentiment diecut from Hero Arts, and a printed "birthday" sentiment.